Coming off back-to-back wins for the first time this season, South Carolina has some momentum heading into its road game at Florida. The 5-3 Gamecocks, 4-3 in SEC play, also have an opportunity to jump the 6-3 Gators, 4-3 in SEC play, in the SEC standings by winning this weekend in Gainesville. Considering Florida just lost at home in emphatic 38-17 fashion to Missouri, a team South Carolina has already beaten, many would assume the Gamecocks should be a favorite heading into this matchup. Will Muschamp cautioned against that line of reasoning, noting that’s not how college football works. 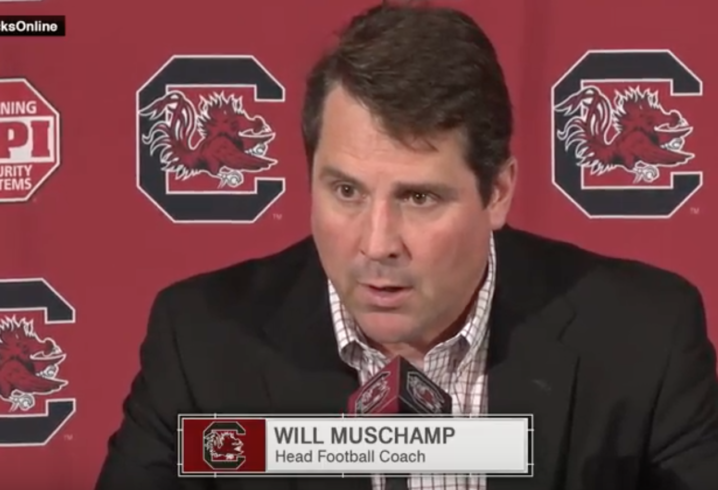 During his Tuesday media availability, Muschamp previewed the upcoming matchup and provided the latest update on his program heading into the final SEC game of the season. latest Gamecock injury report: Javon Charleston and Jamyest Wiliams are out for the season. Nick Harvey and JT Ibe will be out. Everyone practice except Bryson Allen-Williams, Rico Dowdle and Aaron Sterling. I’ll know more as the week goes on, they are day-to-day at this time. on prepping for potential playing multiple QBs: I don’t know that they change a lot, depending on the quarterback is. Obviously, Dan is going to play to their strengths and the things that they like in the throwing game and such. I don’t know that there is a big contrast in those two guys and what they like to do. on winning back-to-back games, does that lift the team? No, our guys have been pretty steady in their approach each week and understanding the workmanlike attitude on a Tuesday, same for Wednesday and Thursday and that’s one thing these guys do, they work. Their preparation has been good. with injuries at safety, are you tempted to move Dakereon Joyner to defensive back? No. Are you committed to keeping his as a QB: Committed as a quarterback. Can Jake Bentley take what Drew Lock put on film against Florida and use in this game? Every week is a season, every single week is a different deal and we will face a different Florida team than what we saw on tape. We prepare for the tape as you watch it… but every week is a season. on Josh Belk attending Clemson game: We had a conversation. We’re fine. Muschamp is asked why Florida can’t develop a QB: I’m the head coach at the University of South Carolina. Ask Dan. Next question. I got asked that a lot, I’m not answering it now.